In recent years one in every twelve humanitarian entrants to Australia have resettled in Melbourne’s south east, in the Cities of Greater Dandenong and Casey. The region’s Refugee Health Research Consortium commissioned a study to examine whether the primary healthcare needs of local residents from refugee backgrounds were met by existing primary care services in the region. The Southern Academic Primary Care Research Unit (SAPCRU) completed this study in May 2011.
recommend priorities for local research and primary care service development. For a copy of the report visit SAPCRUs website. Cheng IH C, Russell, G, Bailes M & Block A (May 2011). 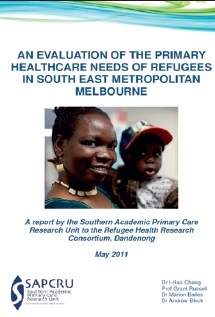 Document name: An evaluation of the primary healthcare needs of refugees in south east metropolitan Melbourne. Southern Academic Primary Care Research Unit.